In January 2019, Pompeo demonstrated interest in running for the U.S. Senate in 2020, after long-time senator Pat Roberts (R-KS) announced he would not seek re-election. Senate Majority Leader Mitch McConnell was said to be in favor of Pompeo running, as he was a prominent name, would likely discourage other Republicans from running, and would increase the likelihood that the Republicans would retain that seat. While Iran and North Korea were the major foreign policy issues for the Trump administration and the public in Pompeo’s first few weeks as secretary of state, he also foreshadowed another issue that would rise to the top of his agenda in the future. At the first meeting during his tenure of the Organization of American States (OAS), Pompeo called for Venezuela’s ouster from that body. “The regime’s refusal to take meaningful action on these issues [of democracy] has demonstrated unmistakable bad faith and exhausted options for dialogue under current conditions” said Pompeo. In January 2019, immediately after the new far-right government of Jair Bolsinaro took power in Brazil, Pompeo met with the Brazilian foreign minister and with Bolsinaro himself to discuss targeting Venezuela, along with Nicaragua and Cuba, for what he considered their lack of democracy and respect for human rights. He said that the three countries “do not share the democratic values that unite the United States and Brazil.” Venezuela’s foreign ministry characterized Pompeo’s words as an “interventionist attitude,” and accused him of seeking “forcible regime change” in Venezuela. As Venezuela descended into crisis under the weight of rampant inflation, hunger, and rioting over president Nicolas Maduro’s inauguration in the wake of a widely disputed election, the Trump administration continued to press the case for regime change. The U.S. was the first country to recognize the leader of the Venezuelan national assembly, Juan Guiado’s claim to be the legitimate president. In a strong signal of the Trump administration’s intentions, Pompeo named Elliott Abrams—who had pled guilty to lying to Congress about the Iran-Contra scandal in the 1980s, and had been a key figure not only in U.S. support for the Nicaraguan Contras, but also for the regimes in Guatemala, El Salvador, and Honduras, all of whom committed major human rights violations and war crimes–as his special envoy for Venezuela. Pompeo declared that the United States would dispatch $20 million in humanitarian aid to Venezuela “as soon as logistically possible,” which was understood to mean when the government they recognized—that of Guiado—would be able to receive it. In response, Maduro announced he was severing ties with the U.S. and ordered all U.S. personnel to leave the country, an order Pompeo said was invalid. Maduro eventually backed off of the demand. Days later, the United States slapped additional sanctions on the Venezuelan state oil company, choking off one of the Maduro government’s few sources of income and froze Venezuelan assets in the U.S. The summit was held in Singapore in June 2018. Trump made bombastic statements about how successful it had been and that there was no longer a nuclear threat from North Korea. Pompeo was to continue the negotiations, based on vague promises of “de-nuclearization” which were widely seen as ephemeral and based on very different views of that concept between North Korea and the United States. In August 2018, it was revealed that Pompeo had requested that North Korea hand over “60 to 70 percent of its nuclear warheads within six to eight months.” The North Koreans rejected the request, which was an odd one to begin with since they have also refused to divulge the size of their nuclear arsenal. As 2019 dawned, Pompeo embarked on a nine-country trip to the Middle East. It was an important sojourn as President Trump had recently surprised his own cabinet as well as allies and adversaries in the region and around the world by suddenly announcing the withdrawal of two thousand U.S. troops from Syria. The announcement led to the resignation of Secretary of Defense Jim Mattis and left many leaders wondering what U.S. policy was, in Syria and in the Middle East more broadly. Pompeo was tasked with reassuring U.S. allies in the region, and he had his work cut out for him. At the same time, national security adviser John Bolton was scheduled to meet Turkish leader Recip Tayyip Erdogan to try to clarify U.S. intentions. The meeting never took place due to Erdogan’s offense at public comments Bolton had made. Pompeo’s task was even more difficult because of the nine countries he would visit, five did not have ambassadors. Those five were all crucial regional allies—Saudi Arabia, Qatar, Jordan, Egypt, and the United Arab Emirates—and each of them were facing various crises that held concerns for U.S. regional policy. High-level vacancies had been one of the State Department’s biggest issues throughout the Trump administration, and Pompeo—despite having vowed to get the positions staffed quickly—had been unable to address the issue adequately in his first year in office. After Trump violated the Iran nuclear deal by unilaterally ending the United States’ participation in the Joint Comprehensive Plan of Action (JCPOA), Pompeo took the lead in both defending Trump’s decision and pressing forward with an aggressive plan of unilateral action. In his first speech in his new position, Pompeo presented a list of demands that were widely criticized as untenable and a recipe for confrontation. But the summit met with a cool reception among European officials, the very people the United States was hoping to press for more engagement in opposing Iran. European Union foreign policy chief Frederica Mogherini said she would not attend and was said to have referred to the confab as an “anti-Iran conference.” France’s foreign minister expressed similar sentiments and neither Germany nor the United Kingdom made any statements about the potential meeting at all. Pompeo soon backtracked and described the conference as a “Ministerial to Promote a Future of Peace and Security in the Middle East,” in an attempt to portray it as having a broader agenda. An anonymous senior U.S. official specifically said, “It’s important to underscore that this is not an anti-Iran meeting or coalition-building exercise.” He said that the conference would discuss the crises in Syria and Yemen as well as missile proliferation, cyber issues, human rights and refugees. Pompeo’s view contraseds sharply with that of Gen. James Mattis, Trump’s Secretary of Defense for his first two years, who although critical of the Iran agreement argued that the United States cannot unilaterally walk away from it. 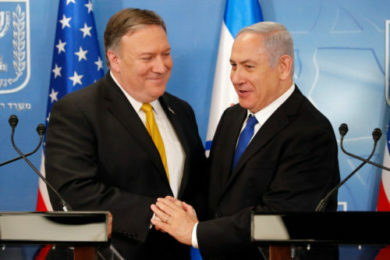 Pompeo’s confrontational approach to Iran has included calling for preemptive bombing of Iranian nuclear sites, introducing legislation that would block the U.S. purchase of heavy water from Tehran, requesting a visa from Iran to “monitor” its elections, and joining neoconservative Sen. Tom Cotton in the misleading claim that there were “secret side deals” between Iran and the International Atomic Energy Agency that the Obama administration kept from the public to get the Iran deal through. Trump nominated Pompeo as director of the CIA shortly after his victory in the November 2016 presidential election. 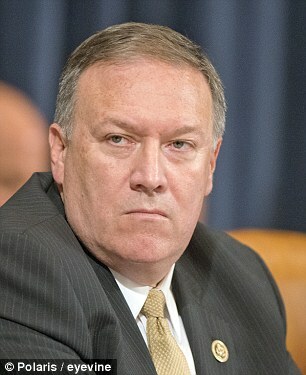 Reports indicated that one of the reasons he was chosen over other candidates was because of his fierce condemnation of Hillary Clinton, which as one observer wrote “is hardly the sort of criterion that makes for good intelligence.” Former CIA director Michael Hayden, a Middle East hawk and Trump critic, has called Pompeo a “serious man.” However, many foreign policy experts are alarmed by Pompeo’s lack of experience and antagonistic views on Iran. During his initial Senate confirmation hearings in early January 2017, Pompeo reaffirmed his hawkish views on Iran, and also staked out a hardline on Russia, appearing to differ from Trump. He argued that Russia was threatening Europe and the Ukraine and “doing nothing to aid in the destruction and defeat” of the Islamic State. Pompeo has served on major congressional committees, including the House Intelligence Committee, which oversees intelligence-gathering efforts. In 2014, Pompeo was also appointed to the House Select Benghazi Committee. A military veteran who graduated from West Point, Pompeo “served as a cavalry officer patrolling the Iron Curtain before the fall of the Berlin Wall. He also served with the 2nd Squadron, 7th Cavalry in the Fourth Infantry Division. After leaving active duty, [he] graduated from Harvard Law School having been an editor of the Harvard Law Review.